Visit the author online and on Facebook! I love a good regency romance, so I was thrilled to get my hands on an early copy of this for review, but sadly I came away disappointed. I'll begin with what I did like -- the couple is married. I don't think I've ever read a regency with a love match, not a marriage of convenience thing, with the couple already married. It really makes for a unique twist. However, the story is teeeedious. Now, I like romances that have an actual plot (this author does that wonderfully, no mucking it up), but I found myself skimming over those little moments between the pair because they ended up being two pages when two lines would have done it. They were cumbersome and awkward. It was a little too wordy for this reader and this is coming from an Outlander fan, so I'm used to a more complex love story. 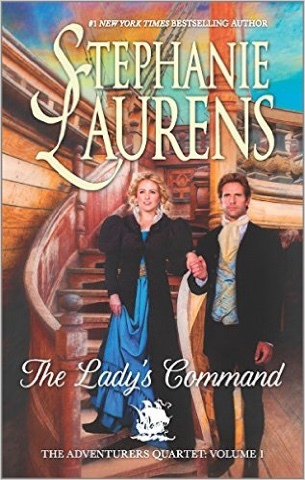 The Lady's Command is certainly an adventure, but I'm not sure if I will continue with this series. Renee, thank you for sharing your real thoughts about this book. You did a good job describing what you liked, and what you didn't like, about the book. Thank you, Suko! I always appreciate your kind words.